Biblical adaptations are nothing new. Lately, there's been a slew of movies like 'Noah' and 'Exodus' that have been huge productions but have failed miserably at the box office. Do audiences really want to see or read these stories? Has the white-washing of characters for these films affected the marketing to larger audiences? Box office receipts on an anecdotal basis show folks aren't interested. Perhaps if those films had been the savage visceral experience that 'The Goddamned' by Jason Aaron and R.M. Guera is then it certainly would have been more entertaining. 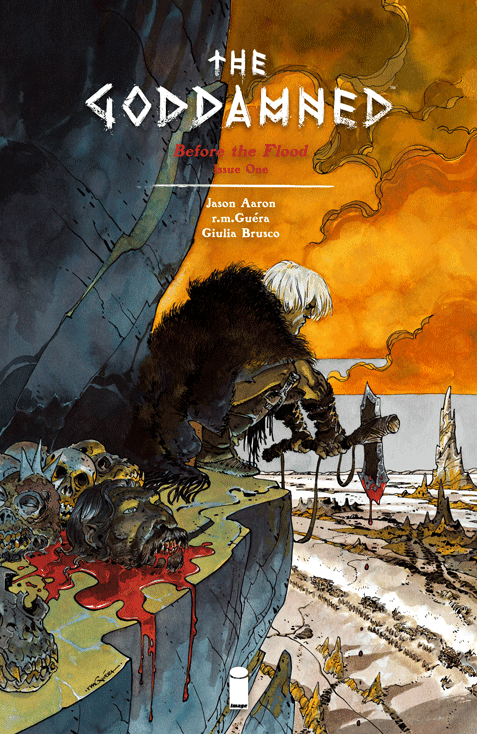 The blonde, blue-eyed male lead aside 'The Goddamned' #1 is a brutal walk through Genesis that is bleak, stark and primitive. Portrayed like a post-apocalyptic western, the literal figure of 'The Goddamned' emerges from the wastelands from actual waste and begins his search for something across this vast unforgiving landscape right out of a Sergio Leone fever dream. The desolate world full of tribes and desperate characters are quick to deliver violence to get what they want. Our hero (?) has the luxury of immortality brought forth from the first sinners who were thrown out of paradise. Cain has had enough of living forever and the steely-eyed road warrior will not suffer fools along his journey. It's survival of the fittest and Cain disposes of his enemies in a ferocious and expediate manner. Aaron and Guera work great together as they did in "Scalped" but it's clearly Guera's showcase. The unrelenting violence is gory, primal, and intense. The aftermath of other kills in this wasteland are bloody and detailed. This barbaric environment is in full display, the fighting, the monsters, the savage lands, is Guera's playground as he indulges in every ugly detail. And it's gorgeous. It helps that Giulia Brusco produces some gloomy and murky colors that add depth to this vast terrain. 'Before the Flood' is the prequel to the infamous great cleansing flood of biblical legend and the fact that Aaron's take on this is framed as a young Clint Eastwood seeking something in a dark desolate wasteland is enough to make it easily accessible and thrilling. It's got enough visceral delight in its brutality thanks to Guera's amazing visuals that 'The Goddamned' is a must-buy.